Senior Iraqi Kurdish politician Mullah Bakhtiar discusses his party’s relationship with Iran and with Kurdish parties in Syria – and in particular, in Kobani and Rojava, as well as whether anyone should be concerned about the unofficial Shiite Muslim militias behaving badly in northern Iraq. The head of the political bureau of one of Iraqi Kurdistan’s ruling parties, the Patriotic Union of Kurdistan, or PUK, talked to NIQASH about his party’s internal and external political turmoil and how the current security crisis is affecting them. Mullah Bakhtiar also said that, despite the fact that the PUK tends to have a better relationship with Iran and therefore, by default, the Shiite Muslim militias sponsored by Iran who are currently up north fighting extremists, his party has also expressed its concerns about their bad behaviour – and to no less than one of the militias’ most important leaders from Baghdad. 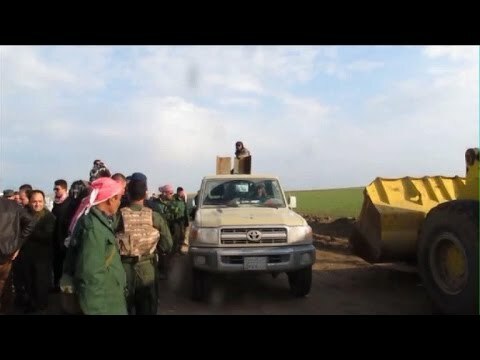 NIQASH: What are the latest developments in the war against the extremist Islamic State, or IS, group? Mullah Bakhtiar: When the Islamic State group first attacked Iraqi Kurdistan we were shocked. But now we’ve been able to develop plans to fight back and contain the situation. We can confidently say that the IS group has suffered one defeat after another. NIQASH: But even before this particular crisis you were among those who expected the IS group to attack Iraqi Kurdistan. Why was that? Bakhtiar: I have a lot of information about terrorist groups in the Middle East – I follow up on their movements and their announcements. Our party actually has a special office for information on these groups. We get very good information coming through and that is why I was convinced that the IS group were ramping up for something big. I wrote an article about it, around three months before the Islamic State attacked Mosul – in that I said they would come and attack us. Bakhtiar: The way things were going in Iraq, it was difficult for anyone to say no to the formation of these Shiite Muslim militias. Baghdad looked like it was endangered and we had to either help by sending troops there or we could work together with Shiite Muslim militias. At that time, the IS group was attacking Iraqi Kurdistan and Sinjar, so we did the latter. And despite all the complaints, the Shiites of Iraq have the right to their own defence too. The war against the IS group is a matter of survival for Iraq’s Shiites too. But it is true that some of the militias’ behaviour has not been correct and we too are concerned about this. NIQASH: Did you discus your concerns with Hadi al-Amiri, the head of the Badr Organisation, during his visit to Iraqi Kurdistan? Bakhtiar: We have informed all the Shiite Muslim actors about our concerns, not just Hadi al-Amiri. When he came to Sulaymaniyah, we signed an agreement that clearly stated that the Shiite Muslim militias in the north would not be in charge of the areas of Jalawla and Sadiya. The agreement states that the areas will be ruled within the framework of government institutions. NIQASH: Speaking of these areas you have publicly said more than once that the Iraqi Kurdish military will not withdraw from the areas they are in – and in particularly, the disputed territories they are in. Won’t this eventually cause friction with the federal government in Baghdad? Bakhtiar: Yes, it will. After the IS group is defeated we think that’s what the next round of disputes are going to be about – where the Iraqi Kurdish military are stationed and Article 140. NIQASH: But the President of Iraqi Kurdistan, Massoud Barzani, has famously said that Article 140 has been implemented and that he doesn’t want to talk about it anymore. Bakhtiar: When Barzani said that he didn’t mean that we shouldn’t discuss the matter with the central government. He meant that a long time has passed since Article 140 was formulated and nothing has happened, and that in the matter of Kirkuk, that it has been resolved. The best answer to those Arabs or Turkmen who believe that Kirkuk belongs to them is the number of Iraqi Kurdish who have died defending it. If those other groups believe they should have Kirkuk then let them come and join the Iraqi Kurdish military in defending it. NIQASH: Given that the Iraqi Kurdish military are indeed defending Kirkuk and some of the other disputed territories, have you noticed any changes in attitude from local Arabs and Turkmen? Bakhtiar: The number of those supporting Article 140 is now higher because they’ve seen the role that the Iraqi Kurdish military have played in the disputed territories. But those hostile to Article 140 have also become more hostile. Before they stood alone against Article 140. Now they’ve joined the IS group to fight the Iraqi Kurdish. NIQASH: Some people have blamed your party for the attacks from the IS group. They say that Iran’s influence on your party and on the region has caused problems. How do you respond to these complaints? Bakhtiar: I want to make it clear that our party has a relationship with Iran that is similar to the relationships that other parties, including the KDP, have with Iran. Our location means that we share around 650 kilometres worth of border with Iran. In the past we too have had problems with Iran which developed into armed conflict. Our relations with Iran normalized in 1996 but they are no different from any other parties in Iraqi Kurdistan. Now we look at Iran’s role realistically. NIQASH: There has been a lot of talk about the leadership vacuum at the top of the PUK. Jalal Talabani has been ill for years and although he recently returned he has been much debilitated by his illness. So if a general conference was held now, what would happen to his post? Bakhtiar: I can tell you my own personal opinion on this. I don’t think we will see another leader like Mam Jalal. I believe this phase has ended. And as a result the PUK needs structural change from top to the bottom. NIQASH: By that do you mean that the leadership of the PUK must be changed? And if so, to what? Bakhtiar: There will be a very serious discussion on the position held by Jalal Talabani during the PUK conference. Whatever happens next will be decided by the members of the PUK. NIQASH: After Jalal Talabani returned to Iraqi Kurdistan did he mention anything about the internal problems that your party faces? Bakhtiar: No, his health doesn’t allow much opportunity to meet with him. And we want to avoid tiring him out. When he gets better we can discuss all this with him. NIQASH: Are you at all worried about the possibility of a split inside PUK, similar to what happened when the Change movement broke away from you? Bakhtiar: We are not afraid of a split. All the parties that have split from us have failed in any aims to weaken us – and that includes the Change movement. The PUK is still here and we have more seats than the Change movement on an Iraqi level. NIQASH: Finally after seven months of negotiations you seem to have reached an agreement with the Change movement about who should hold the post of the governor of Sulaymaniyah. You’ve decided that the PUK gets the first two years of the term and then the Change movement gets the second two years. But it feels like a lot of the supporters of the Change movement don’t trust that the PUK will actually stick to the deal. Bakhtiar: If they are afraid, then so are we. But the PUK really hopes that both parties’ distrust of one another doesn’t have any basis in reality. We hope that confidence increases so that this kind of sharing of a term can become more normal. NIQASH: The relationship between the PUK and the Syrian Kurdish political party, the Democratic Union Party (or PYD) has become closer recently. But there are also rumours that part of that closeness involves an ongoing antagonism towards another Iraqi Kurdish party in the region? Bakhtiar: I’m the one who has built this relationship up between the PUK and the PYD. That’s why we’ve insisted on supporting the Kurds in Rojava and Kobani. The liberation of Kobani is a source of pride for us. We performed our national duty there. However conspiring with the enemy to fight against other Kurdish groups is shameful. NIQASH: Finally, how do you feel about Kurdish independence from Iraq now? The PUK tends to deal more flexibly with the federal government in Baghdad. Does that mean you don’t think the Iraqi Kurdish are ready for independence? Bakhtiar: I can only express my regrets about this question. Because what you are saying is correct.